The ongoing war in Syria is as old as Ottoman History Podcast and its partners, and while we do not claim to be experts on the conflict, we have throughout these years issued occasional comments to counter the superficial or misinformed portrayals of Syria that sometimes appear in the media and stress the importance of a historical understanding that goes beyond the level of surface political events. When the New York Times published an article covering France's stance on Syria that did not mention the country's colonial presence in the region, we offered a reminder of that history. When the Washington Post published a map explaining Syria in the language of nineteenth-century colonial administrators, we put its categories in their context. And when the US was poised for possible military intervention in Syria, we reminded that it was not the first time grand rhetoric was used to justify war in Syria and noted the connections of its last Middle East war to the present conflict. In keeping with this trend, I'd like to feature a few maps that I've encountered during the past years of researching the history of the Middle East. These maps will not explain the present conflict. However, maps seem like an appropriate way of conveying information about Syria in a time when the division of Syria and its neighbors are being heralded in the New York Times and elsewhere. While I'm suspicious of these visions and their basis, I can't say that there is anything historically natural about Syria's present borders. Indeed, we will offer a number of maps of Syria here, only the last of which actually displays Syria's political borders as they are today. 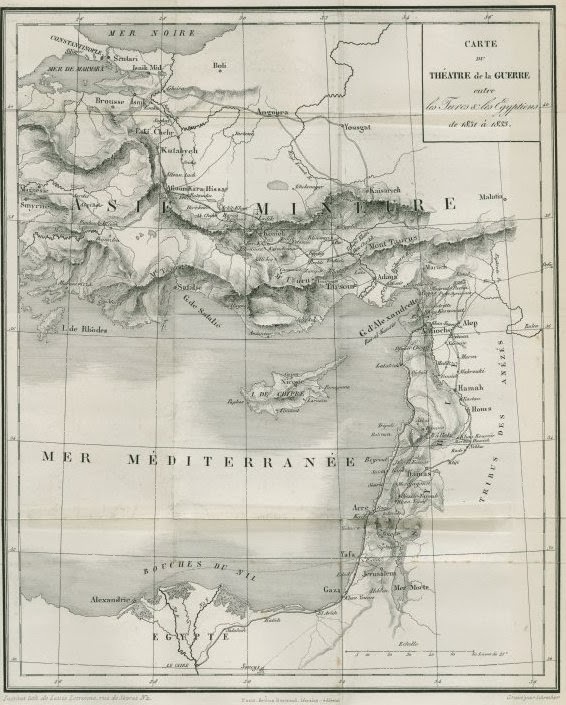 Yet, the eagerness of Western observers to play with the geography of Syria is all too familiar, and in this article, I'll discuss this geography in a historical perspective based on maps from the Ottoman Empire, France, Syria, and elsewhere, encouraging deeper exploration of Syria's history from the Ottoman period to present. The first and oldest map is not so much a work of cartography but rather of imagination (as all maps inevitably are). Because Syria had long been part of Europe's history, from the heyday of Rome and the Bible to the Crusades, its geography and towns have piqued the interest of Western audiences throughout the centuries. 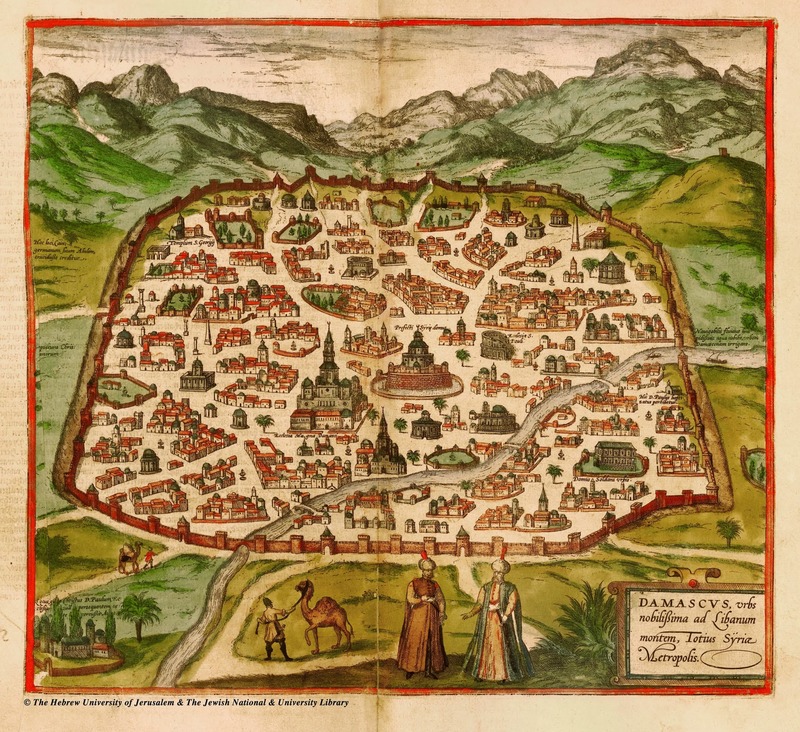 This map of Damascus from Civitates Orbis Terrarum or Cities of the World published in Cologne in successive volumes during the late sixteenth and early seventeenth century illustrates this fascination. 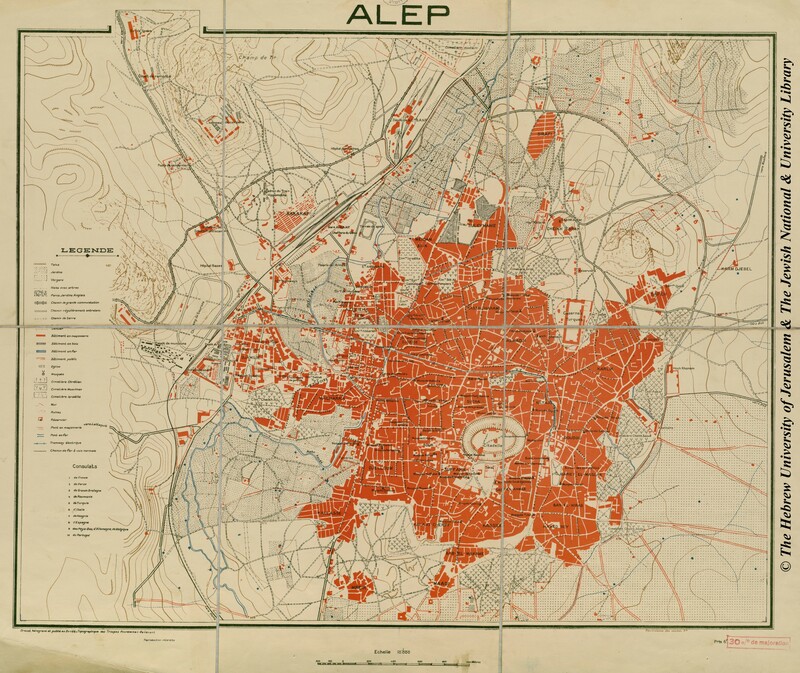 Damascus was one of a relatively small number of non-European cities profiled in this massive work containing over 500 aerial views of urban spaces. I have tried to make sense of what these buildings are supposed to represent in terms of the actual geography of Damascus during the Ottoman period but have given up. Aside from references to St. Paul it is difficult to recognize the city. However, the mention of irrigation using the Barada River, which flows through the city, is accurate, whether or not the river was at all navigable (it certainly has not been in recent history). Most bizarre is the figure of the Great Church of Damascus (large building at center-left), perhaps intended as a mosque, which looks much like a German church with a few domes and a crescent atop its steeple as opposed to a cross. For most of the Ottoman period, which lasted roughly four centuries from 1517 to the end of World War I, there was no administrative province known by the name of "Syria" or "Suriye." Which is not to say that the concept did not exist. The territory of modern-day Syria was mainly spread across the three provinces or eyalets of Damascus (Şam), Aleppo (Haleb), and Rakka (this province changed its boundaries and sometimes name). However, these general boundaries do not match up neatly with today's Syria, nor were they entirely static throughout those years. The Ottoman administration often moved the boundaries of its administrative regions, including the smaller sancaks, kazas, and nahihyes, as was necessary. This American map of the Ottoman Empire (click here for the whole thing) highlights the importance of reading maps from the Ottoman period with care, particularly when they are of foreign origin. 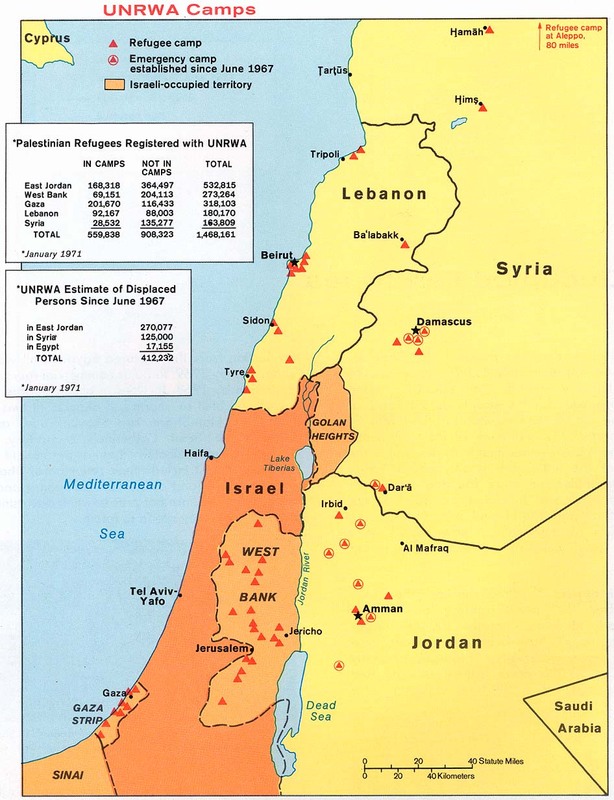 While regions such as Syria and Mesopotamia appear on the map, note that these are only geographical designations intended for the American readership, with Damascus and Baghdad written in as well to indicate the administrative units. Needless to say, the reference to Turkey is the result of a similar phenomenon; the Ottoman government at no point referred to its territories as Turkey though its Western counterparts did. 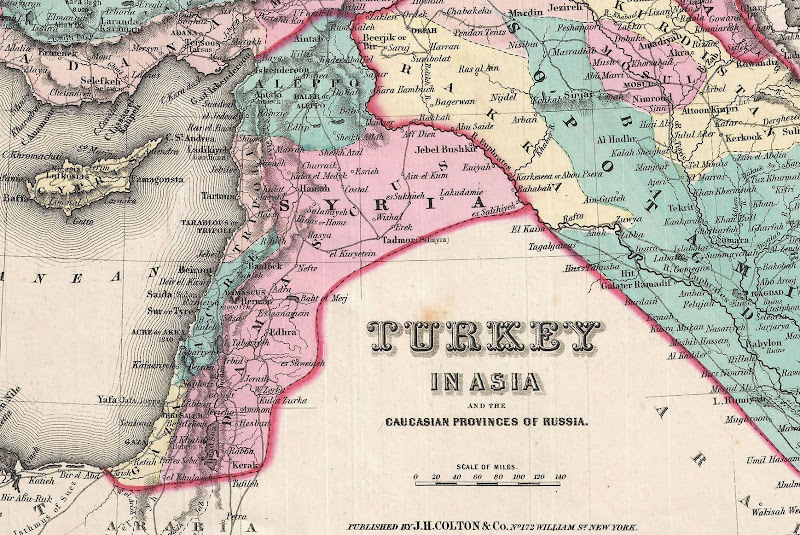 Our blog's editor Nicholas Danforth is nothing if not a staunch defender of cartography, an attribute most admirably exhibited in his advocacy to spare the maps when decrying the troubled legacy of colonialism in the Middle East. Yet, sometimes it is impossible to deny that drawing new administrative borders, calculating and indifferent alike, can be very disruptive. 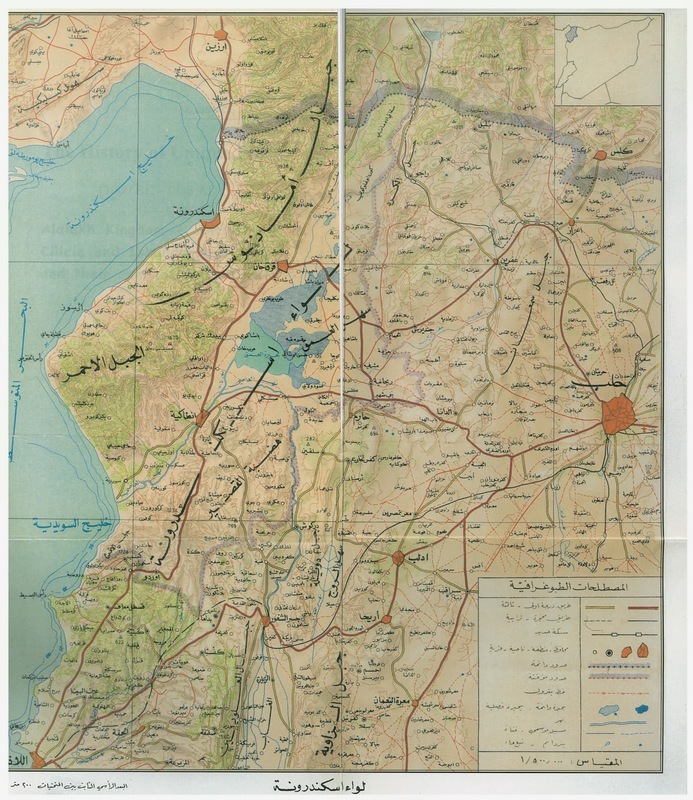 This map produced by the Ottoman Interior Ministry just before World War I showing the major roads in the provinces of Syria and Beirut illustrates this fact. The only major road moving north out of Damascus (Şam) forks at Rayak, proceeding west towards Beirut and north towards Baalbek, both of which would end up French Mandate of Lebanon and its national heir following French withdrawal. This division would not only place a boundary between Damascus and its historically-connected regions in modern Lebanon but also the northern Syrian towns of Homs, Hama, and beyond, for which a separate road that bypasses the Lebanese border would have to be constructed. Editor's Note: I think it's important to point out that when these borders were first drawn, no one expected they would prove as impermeable as they eventually became. When you read documents from the 20s and 30s, there's actually a lot more economic activity and free movement across the Turkish-Syrian border, say, than there was by the 80s or 90s. We should resist the tendency to project the rigidity these borders took on after a century of nationalism and conflict back to the moment of their inception. Another of our dear editor Nicholas Danforth's apt critiques of the map-haters among us is that lamenting the arbitrary borders produced by colonialism suggests that there were somehow natural or logical borders to begin with, implying that if only colonial governments had drawn the borders differently, many disasters could have been averted. When colonial borders (like all borders) were drawn, though, the consideration was almost always maximizing the power of the states doing the drawing rather than improving the lives of those living in the region. These two maps show two different phases of colonial thinking about the partition of Syria during the World War I period. 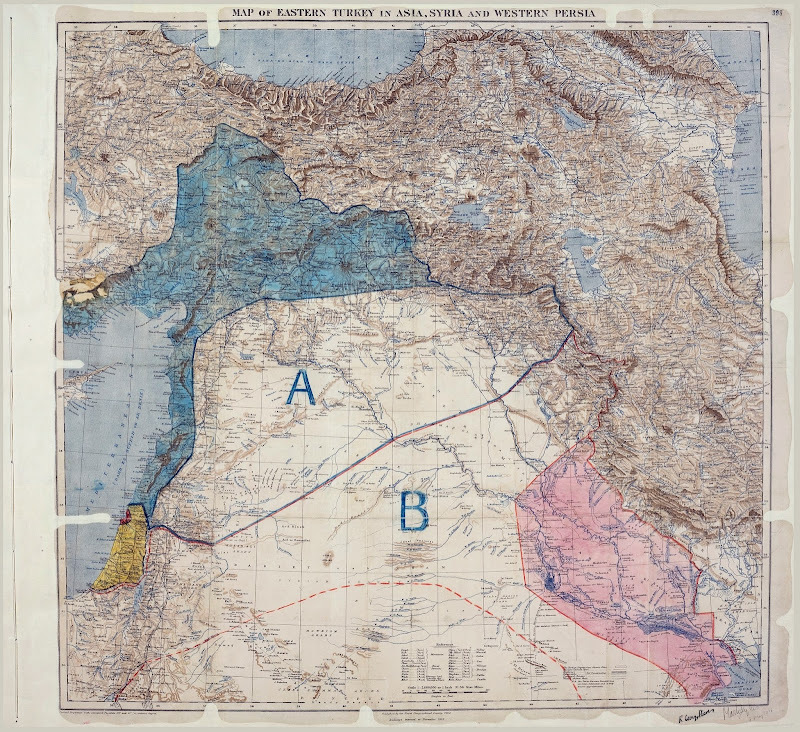 On the left we have the map representing the 1916 Sykes-Picot agreement signed by the men themselves, through whom the French and English reached a deal to divide the Middle East between French territories in the Eastern Mediterranean and British territories in the Persian Gulf meeting at a point to be named later. This was of course one of many conflicting agreements regarding the partition of the Middle East, namely the Hussein-McMahon correspondence through which the British promised an Arab state to the Sharif of Mecca should his supporters assist the British in helping drive the Ottomans out of Syria. Of course, without getting into the many national hopes that were fostered only to be thwarted following the war, we can say that a scaled-back version of Sykes-Picot is what resulted in the case of Syria/Lebanon and Iraq. Now let's move from maps about borders that don't necessarily cut to the heart of colonial practices to a map not about borders that does. We posted the map at right a few months ago coincidentally around the same time the Washington Post ran an article suggesting that the increasingly complex civil war in Syria could be explained by an intricate map of the region's disparate ethnic and religious communities. The map reflected a division of Syria along communal lines seemingly based on the same categories used nearly a century prior during French rule in the region (indeed, the map's source material is likely based in part on French ethnographic data from the mandate period). We found the appearance of such a map in a major newspaper in 2013 to be a peculiar illustration of the enduring impacts of colonial strategies of divide and rule. Finally we have come to an Arabic-language map of Syria with the Syrian Arab Republic, which gained independence from France in 1946. 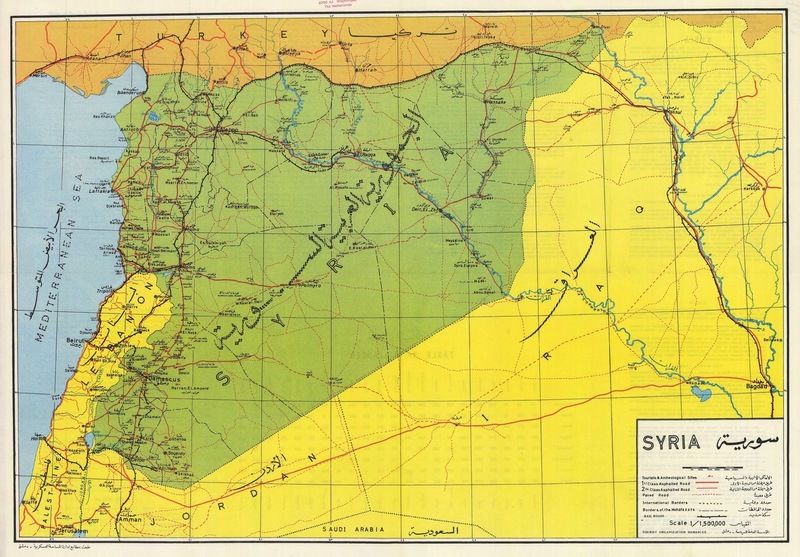 I could not find an exact date on this map, but if we use the political borders of Syria represented in green as a guide, we still have no idea when this map was produced, because regions such as Iskenderun (see Map 11) that were never part of an independent Syria appear as part of the country. Being that this is printed as a bilingual tourist map, we should also warn readers against inadvertently wandering into occupied territory, as the Golan Heights region west of Quneitra has been controlled by Israel since 1967. While Syria has never relinquished its formal claims to these regions, we must note that they have not been the source of any major conflict for decades. That said, tensions between Turkey and Syria over Iskenderun contributed to the cold war era hostility between the two countries which, as suggested earlier, often made life increasingly miserable for people living along the border. In discussing the map above, we mentioned the region of Iskenderun also known as Alexandretta, part of the Hatay province of modern-day Turkey. The port of Iskenderun was historically linked to Aleppo and its surrounding province was initially part of the French Mandate of Syria; however, when France's mandate was set to expire in 1935, a political struggle between Turkey and Arab nationalists in the region began to unfold and Turkey made ultimately succesful diplomatic maneuvers to secure a region. The result was Iskenderun's incorporation into the Republic of Turkey following a League of Nations vote, the integrity of which was compromised in part by the fact that France had already made a secret deal with Turkey promising to hand over the province. The map below displays the Arabic toponyms of Iskendrun and Northern Syria. It is taken from a book by Mufid Arnuq about the history of the Amik Plain region from antiquity to 1938 written in 2001. In this work, Arnuq details the illustrious history of the region, which is indeed home to Antioch, one of the largest cities of the classical world. All discussion of political boundaries aside, the most glaring inaccuracy of the map with regard to the present may be the large blue expanse of Lake Amik and its surrounding wetlands. Following the region's incorporation into the state of Turkey, successive attempts at draining the lake for irrigation, eliminating malaria, and expansion of agriculture have resulted in its complete disappearance. Finally, our last image actually shows the boundaries of modern-day Syria. 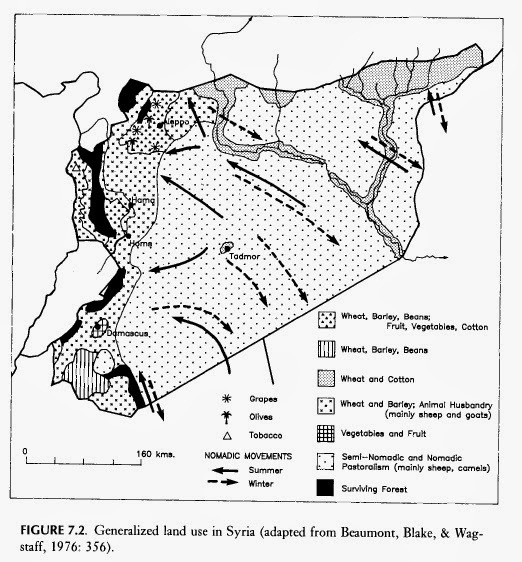 This map from an edited volume entitled The World of Pastoralism provides a view of Syria that seeks to represent the relationship between people and the land. It shows the various regions where different types of crops are concentrated alongside forests and arid regions mainly inhabited by pastoralists. In addition, it shows the directions of seasonal migration of these pastoralist communities that have historically sought to maximize their usage of what vegetation grows in areas of low rainfall. From the olives of Northern Syria and the fruit trees of Damascus to the tobacco of the Mediterranean coast and the wheat fields of Syria's southern breadbasket of Hawran, this map, though not unaffected by changes in irrigation, demographics, and commercial market forces, represents an agrarian geography of Syria that bears strong qualitative resemblances with the agriculture of Syria during the Ottoman period. While recent conflict has brought violence and turmoil to Syria, it has also threatened Syria's agrarian economy, which has historically been marked by robust autonomy when compared with neighboring states. The war has disrupted supply networks and agricultural production, inflating the costs of basic foodstuffs such as bread and cooking oil and extending the war's toll far beyond the areas of fighting, of which there are no shortage, to impact every family in the country. All of these maps beg the pressing question: how can the war in Syria now best be visualized for a curious foreign audience with relatively little background and attention-span? In a subsequent post, we will look at maps that offer a variety of angles on Syria's current state, providing context and commentary when necessary in order makes sense of the maps of the war.